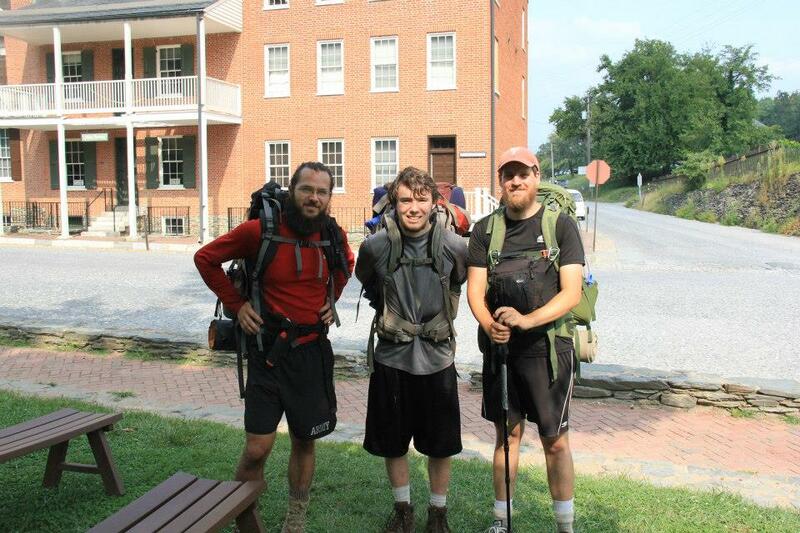 Back in 2013, two buddies and I set out to hike Maryland in four days. 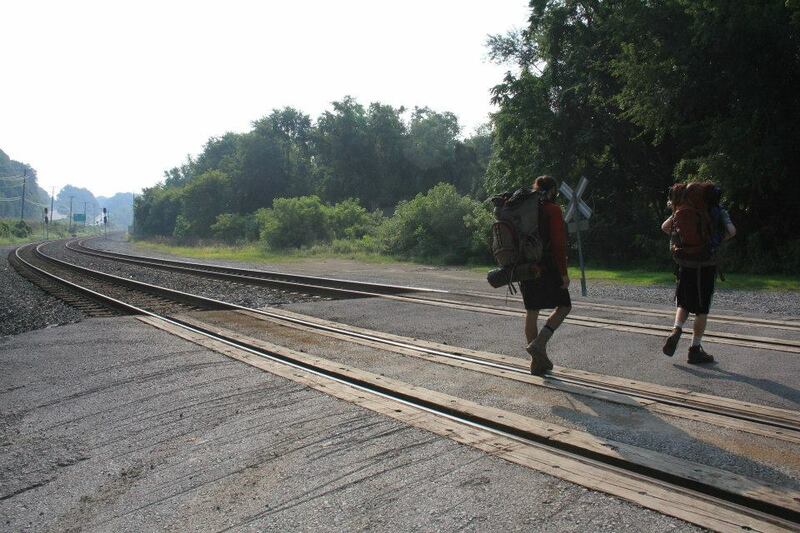 We did this mostly to enjoy our time on the trail, and didn’t do any big mile days, despite friendly terrain. 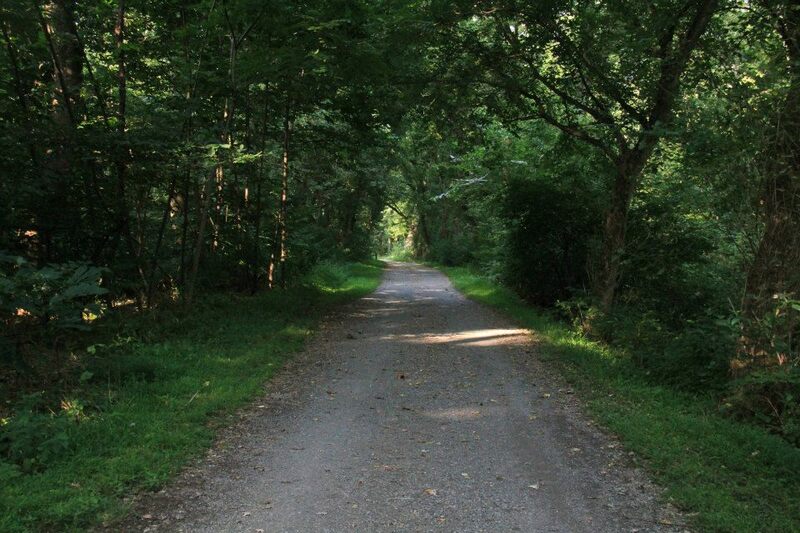 Our trek could be done in three days pretty easily by pushing through where we stopped the last night (heck, thru-hikers are know to do this stretch in one day to complete something called the Maryland Challange), but take your time and enjoy this really nice stretch of trail. 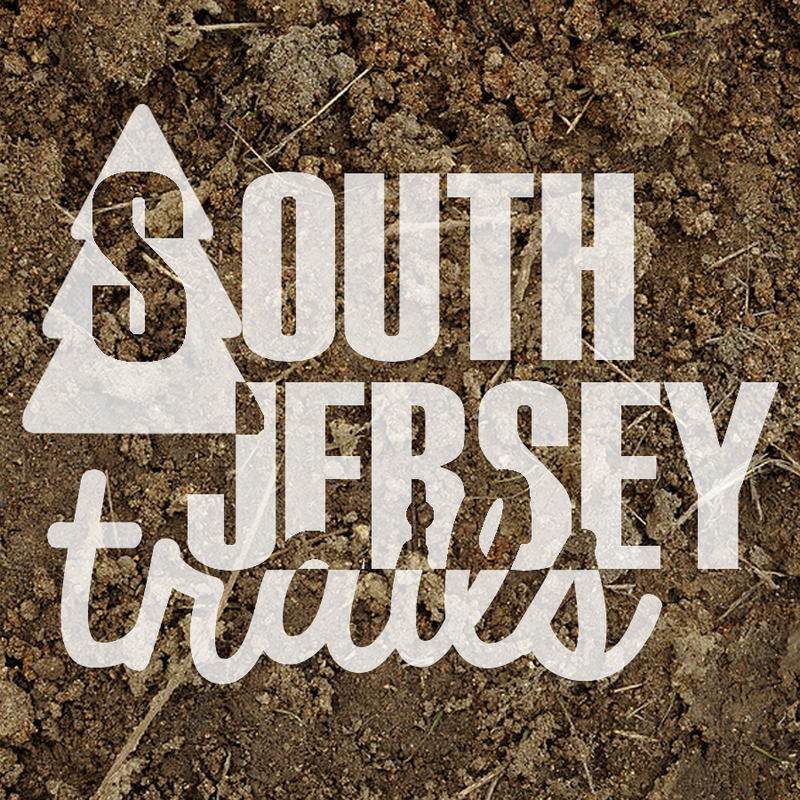 Day 4 – Last day on the trail! While it’s always sad to have a trip come to an end, we were thinking about non-freeze dried food in Harpers Ferry, which kept us moving. 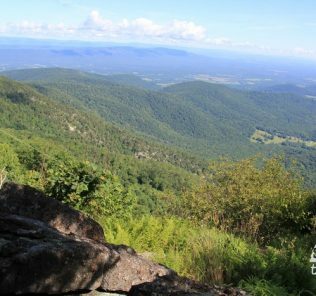 This was the easiest day – 7 miles total, practically no uphill at all, beautiful views at Weverton Cliffs, and the easiest walking imaginable along the three flattest miles of the AT along the C&O Canal Townpath. 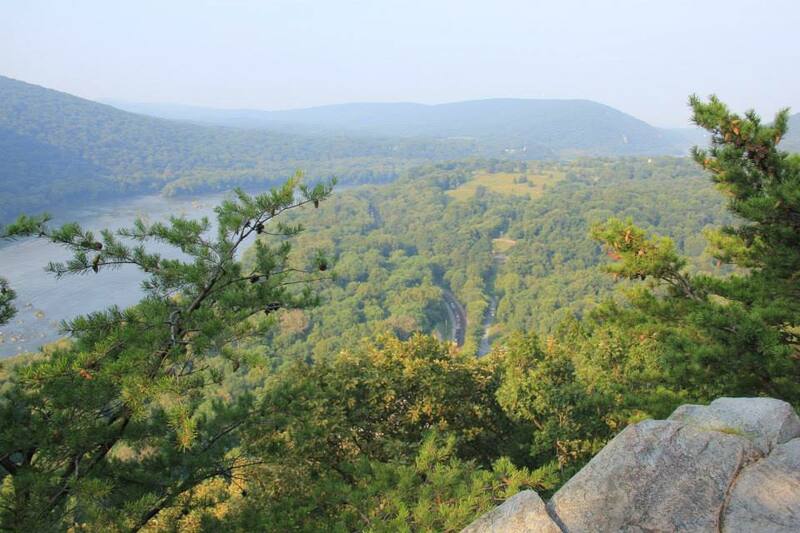 We finished the trail at one of the landmarks of the Appalachian Trail – the Appalachian Trail Conservancy Headquarters in beautiful Harper’s Ferry, West Virignia. 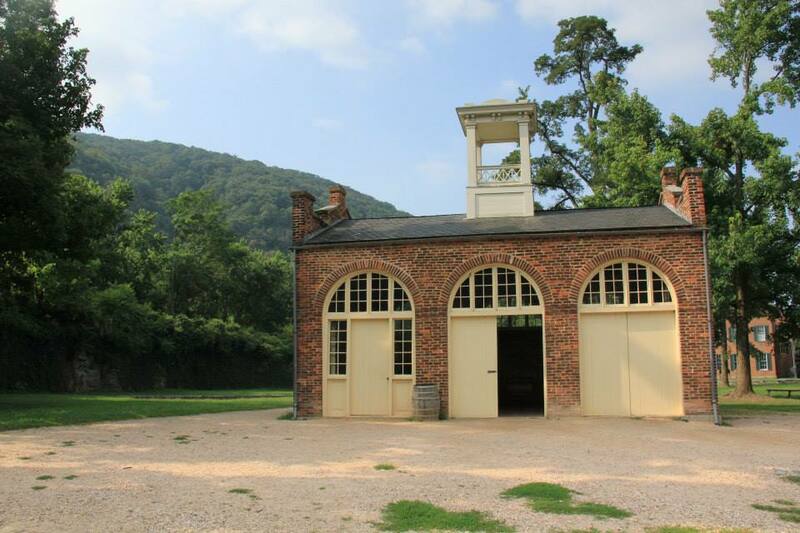 We then wandered down the road back into Harpers Ferry National Historic Park, where we ate hamburgers and nachos to celebrate, then made it onto the national park’s bus to get back to our car. Last day on the trail! 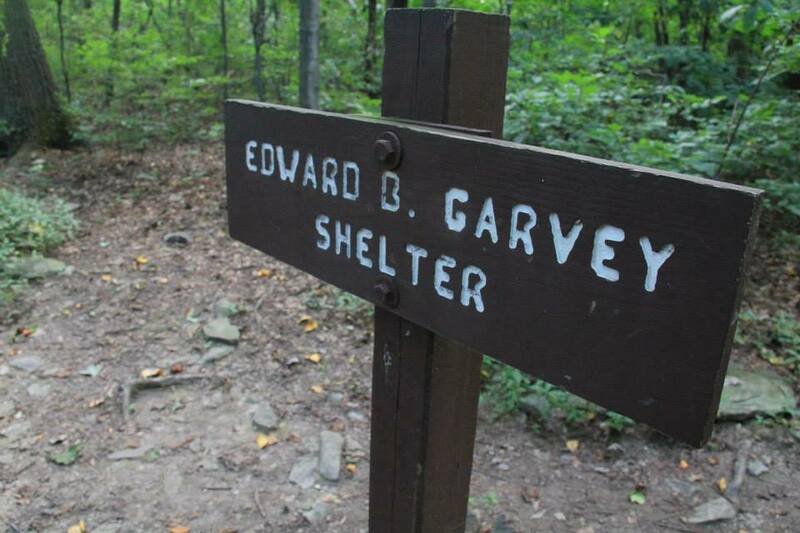 We were up at a decent hour and hit the trail, leaving the Ed Garvey Shelter. This was, by far, the easiest trail day, just what you want when you have to drive 3 1/2 hours home AFTER you pick up your car. There are two minor uphills in the first two miles, but nothing too bad at all. 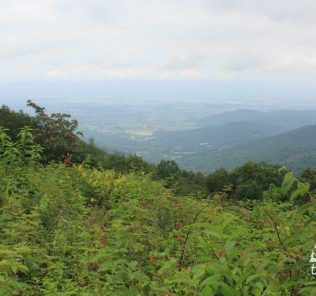 A little over a mile from the shelter, you’ll start the big descent, 800 feet over two miles. 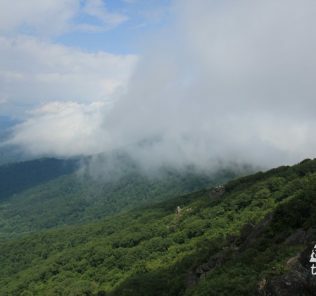 Just after the two mile mark (and halfway down the elevation drop), there is a blue side trail to check out the Weverton Cliffs. It’s well worth taking (and only 0.1 of a mile), don’t miss it! Told you. The Potomac looks great up here. After this comes a series of switchbacks that I was very, very glad to be going DOWN and not UP. 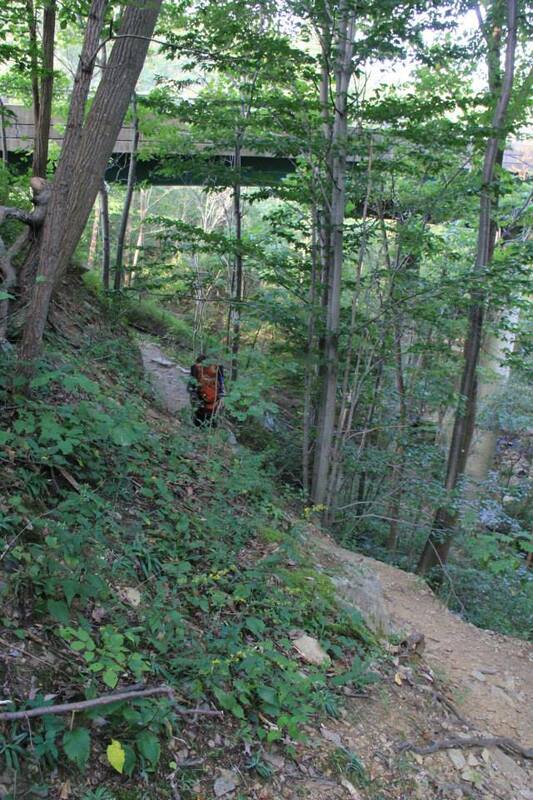 They’ll drop you the last 450 or 500 feet over the last mile or so of this section. You’ll cross Weverton Road and pass the parking lot. Hooray! 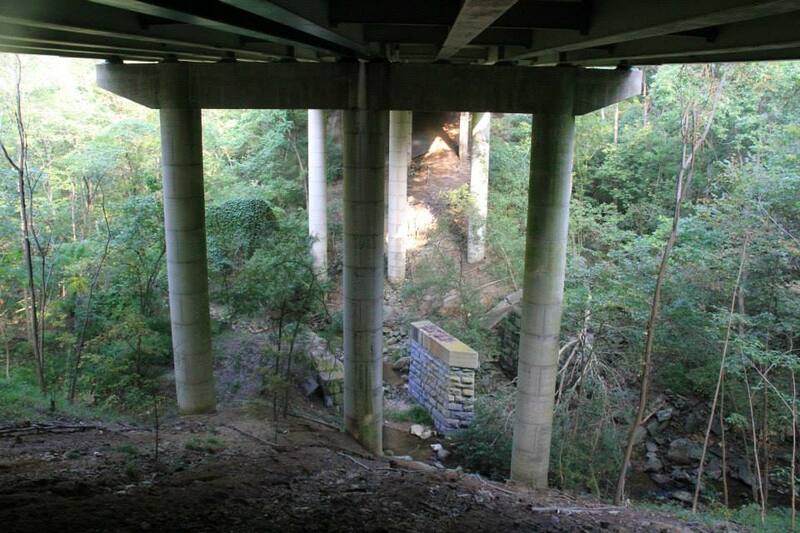 From the parking lot, you’ll go under the highway. 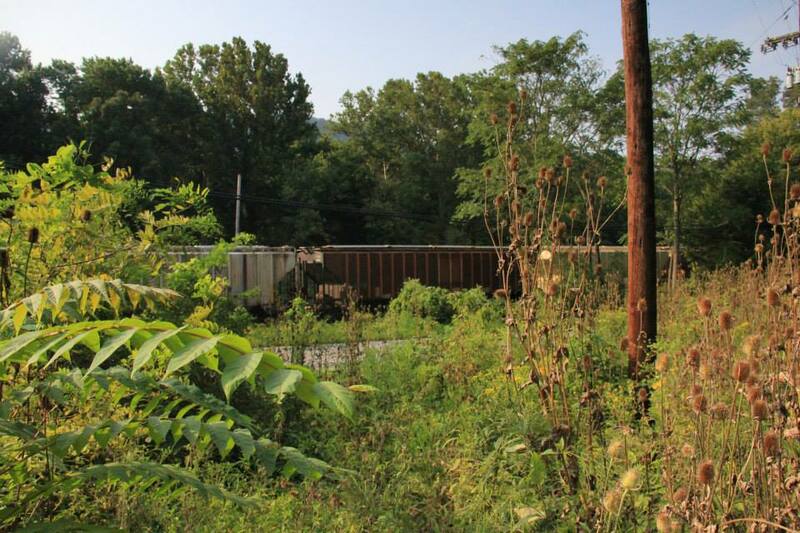 The rail will end up following, then crossing Weverton Road and the old B&O Railroad tracks (if you don’t this property, you must pay rent. Try not to mortgage Boardwalk to do it, that place will make you rich). Old bridge under a new one. This is an active train line! 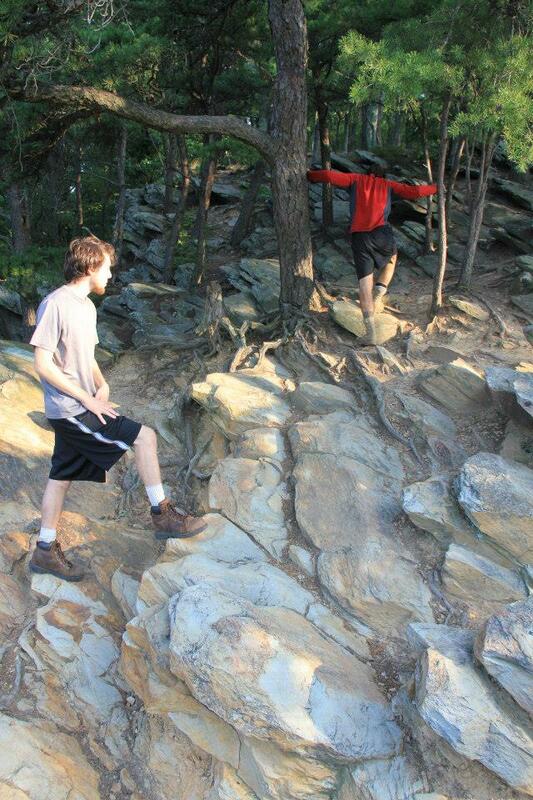 That’s where we just came down from. 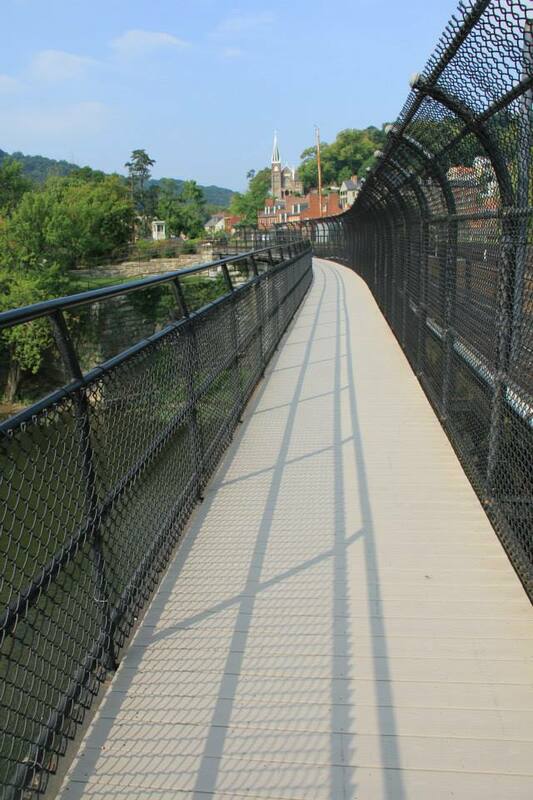 This will put you on the Chesapeake and Ohio Canal Towpath. Turn right and joy what’s rightly regarded as the easiest three miles of the Appalachian Trail, a completely flat, dirt packed path. 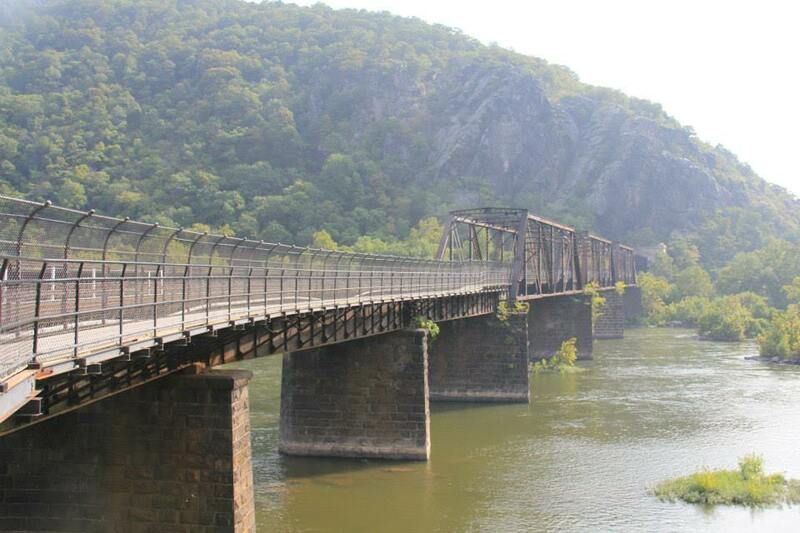 After 2 1/2 miles, the railroad will cross the river on a large bridge. 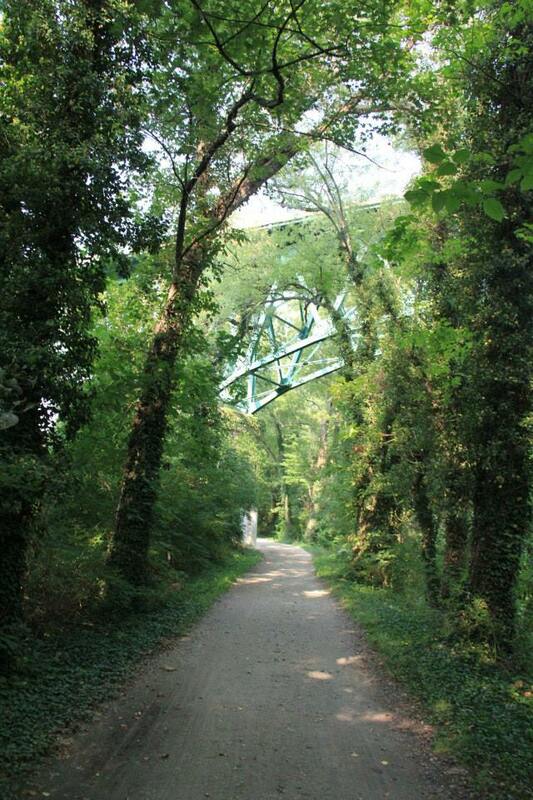 Walk under the bridge, climb the stairs, and cross over. You’ve made it through Maryland! Congrats! Up and onto the bridge. 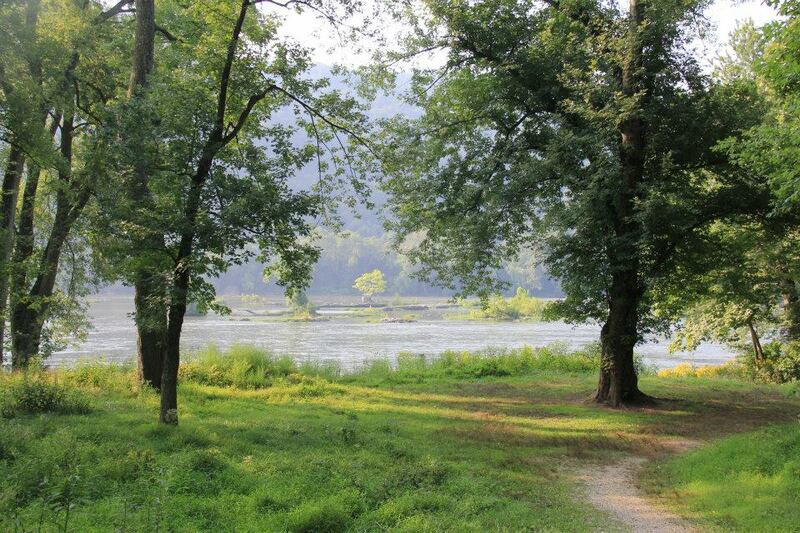 Enjoy your views on the river. 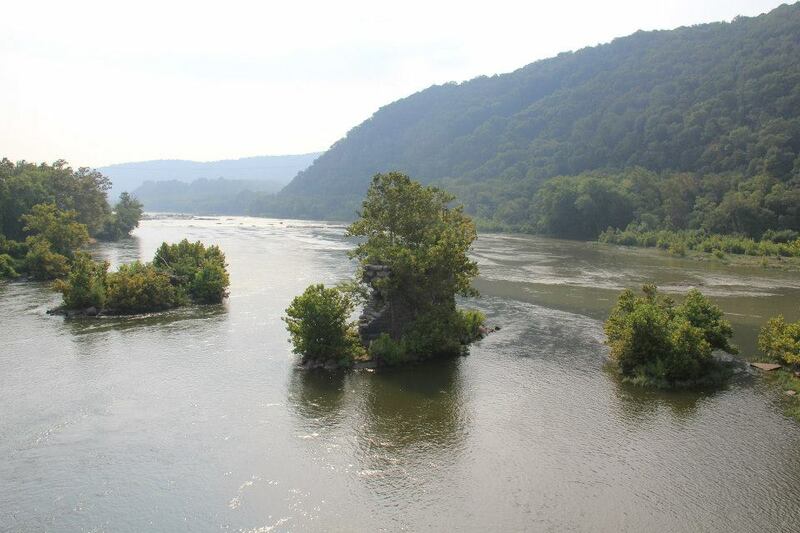 Actually, rivers, the Potomac and Shenandoah come together here. 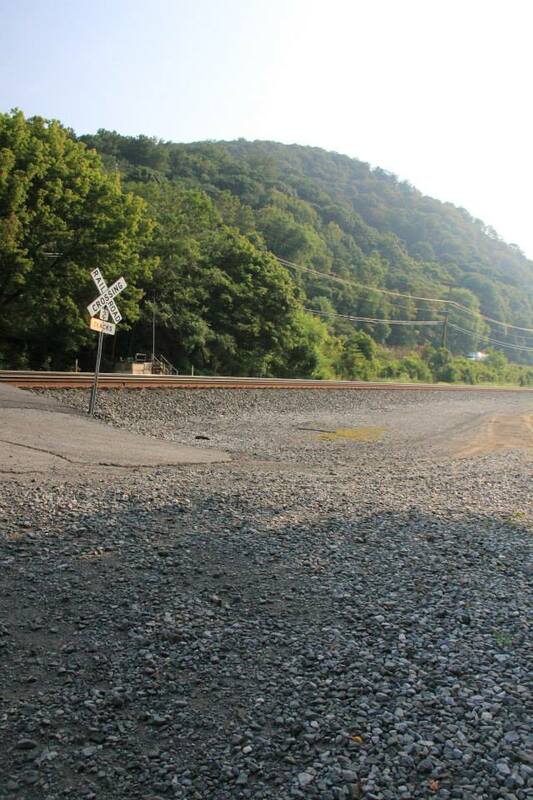 Welcome to West Virginia! 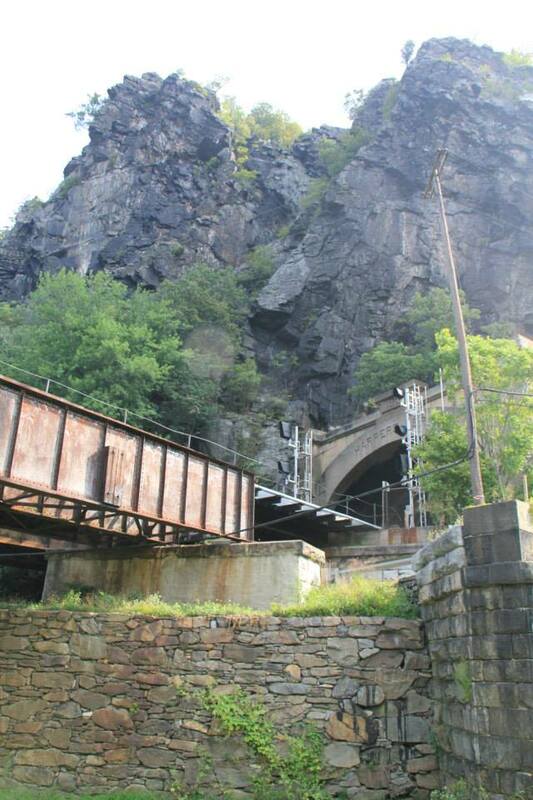 You’ve reach Harper’s Ferry! You’ll follow the white blaze through town, which are posted on the lightpoles. 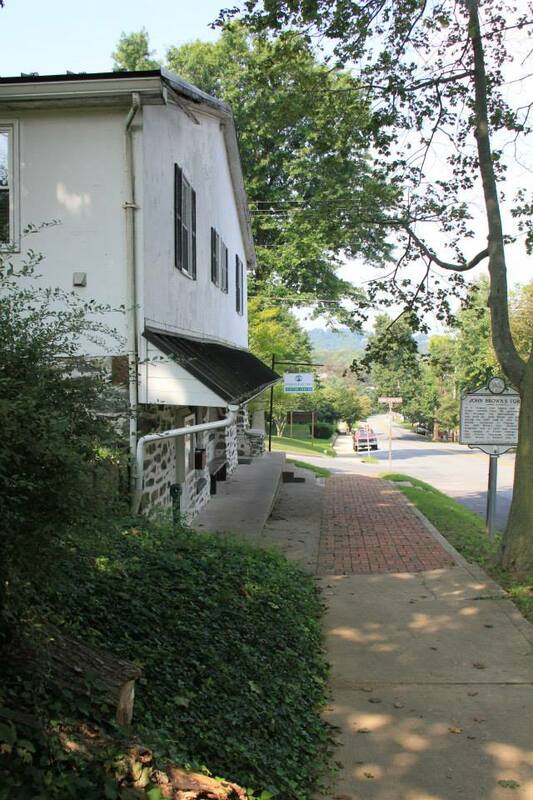 The trail travels past the firehouse that John Brown holed up in, turns and goes through some backyards (seriously), then climbs some stairs. Apparently, we have more walking left than we thought. Passing John Brown’s fire house. Through backyards and heading up. 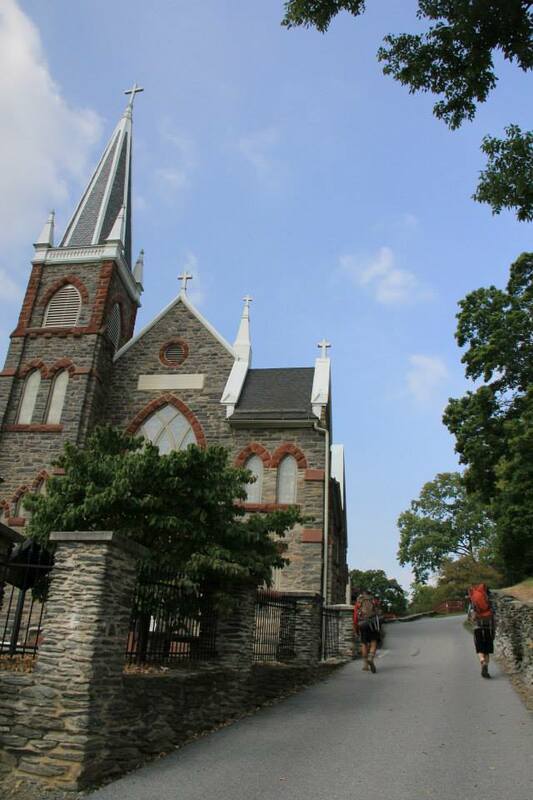 On your way up the many stairs, you’ll pass the Harper home, some old churches (some active, some in ruins), and come to Jefferson Rock. 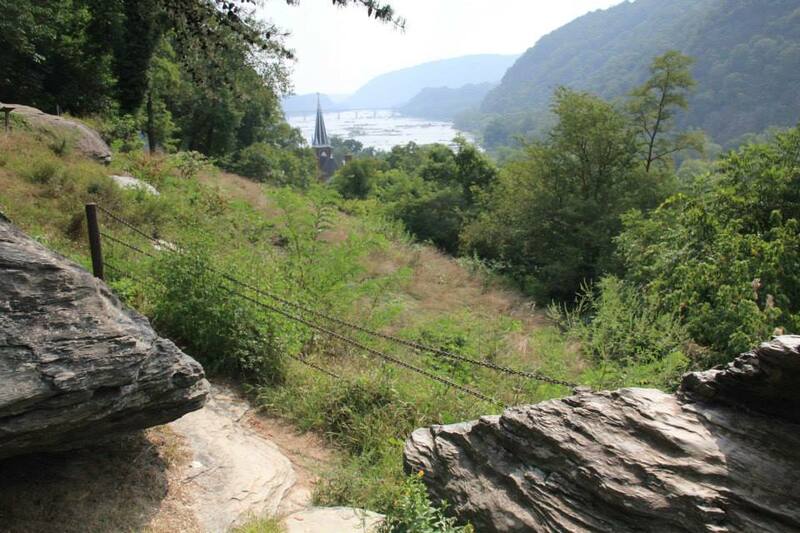 Take a few steps over to the rock for the classic view of Harpers Ferry back the way that you came. Thomas Jefferson himself said it was worth a boat trip across the Atlantic Ocean just to see this view. We’ll assume a 40 mile walk is also worth it (it is). 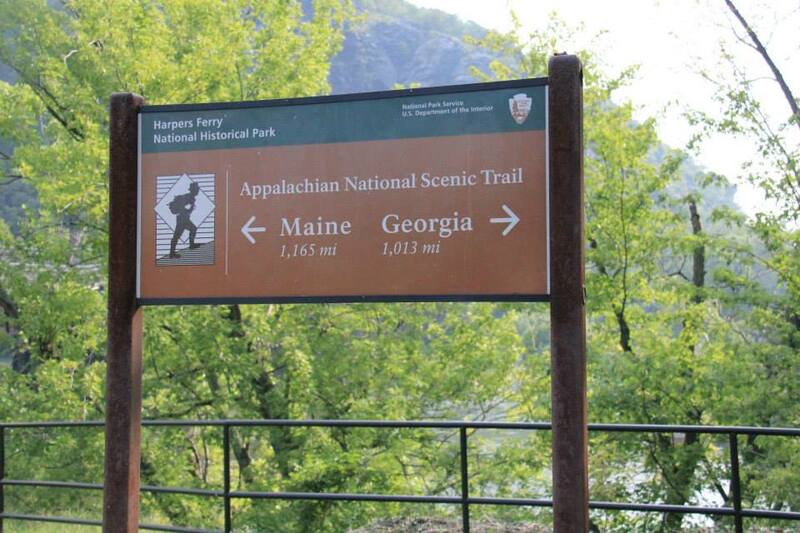 3/4 of a mile from the bridge that brought you into West Virginia, you’ll leave the Appalachian Trail for the last time this trip. Take a blue blazed trail, which will cut across the campus of historic Storer College (which began teaching ex-slaves and grew into a college, but closed in 1955) and down to Washington St (by way of Jackson Street). 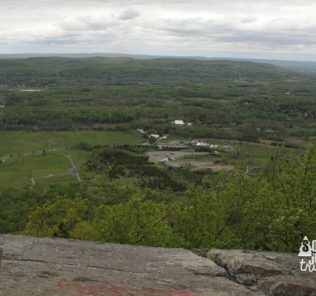 There you’ll find the Appalachian Trail Conservancy. 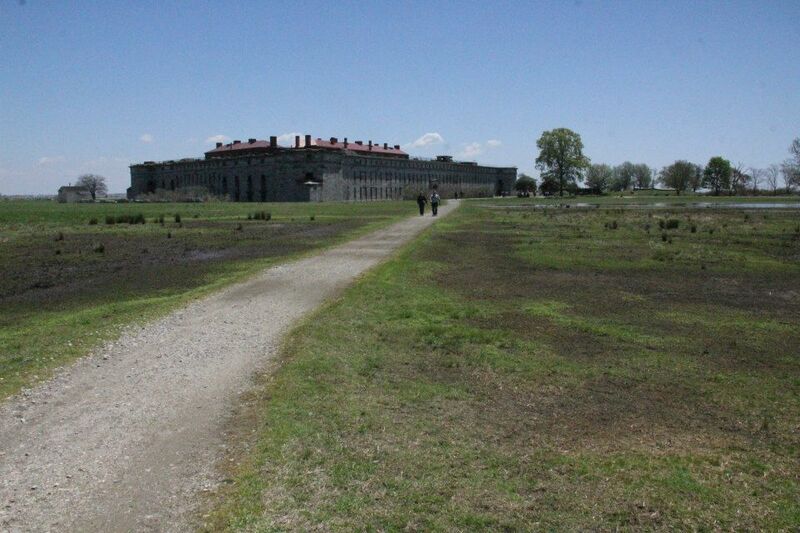 From this building, efforts to conserve and maintain the trail are coordinated. They have a small museum, an excellent book store/gift shop, and a super friendly/helpful staff. Thru hikers and people who plan to section hike the whole trail have their picture taken on the front porch and placed in an album. You can browse those albums in the hiker lounge. And since you enjoyed your trip so much, why not join the ATC as a member while you’re here? 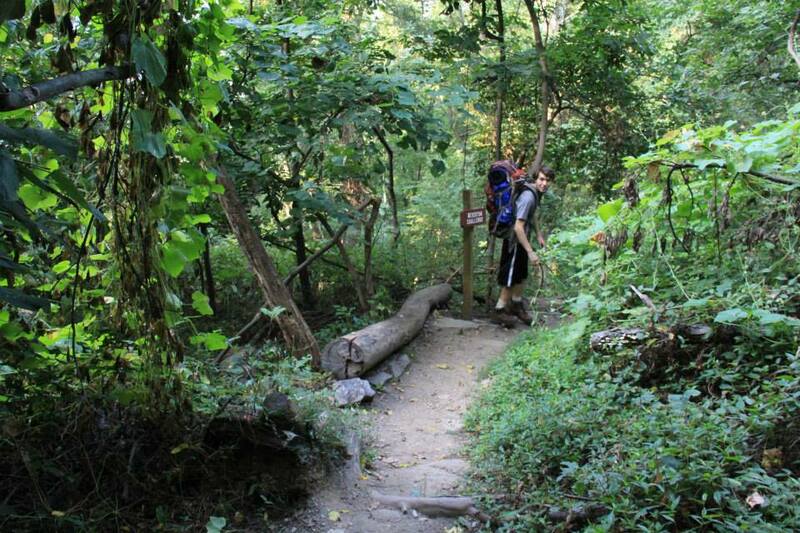 While this may be the end of our hike, it’s not the end of your trip. Head down (hill) Washington Street and back into the historic “lower town” of Harper’s Ferry. Plenty of place here to grab hot, non-dehydrated food, some ice cream, and cannon pencil sharpener… the usual. 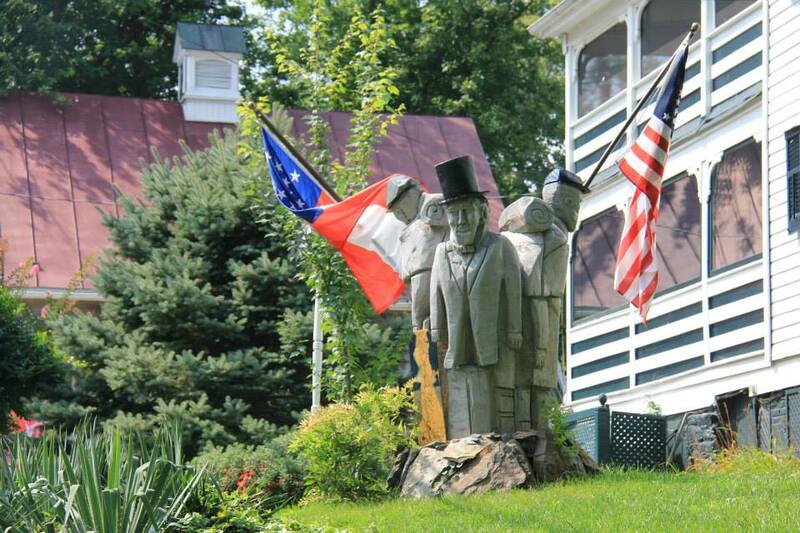 Or check out classy, historic lawn ornaments. For cheap, good food (a lot of very expensive places in town), I suggest the upstairs part of Scoop’s Ice Cream/Candy shop on High Street. Burgers and nachos are good, and they very nice about backpacks and not smelling great. Bonus is a view of the rail station out the windows. 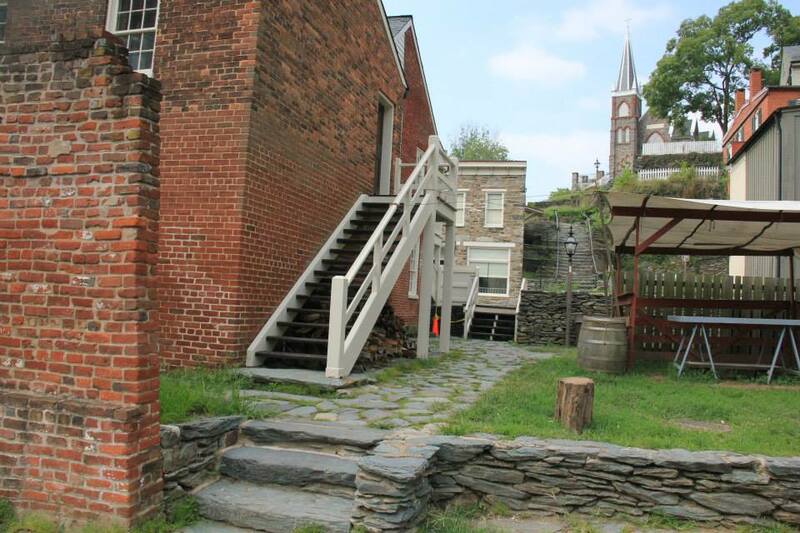 Harpers Ferry also has many museums and such that are part of the national park, they are nearly all excellent. 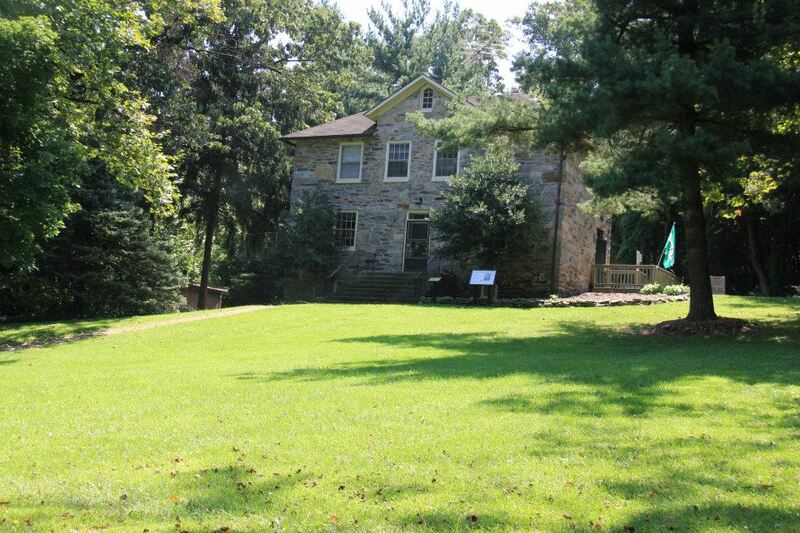 When you are all done, walk down Shenandoah Street to the bus stop, where you can take the National Park Service Bus back to the Visitor’s Center to collect your car. 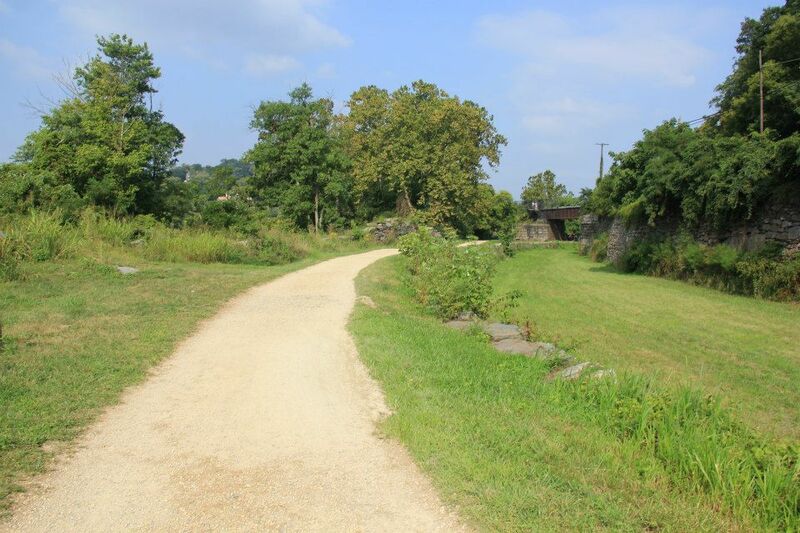 Shelters – No public shelters or campgrounds on this stretch, although there is the popular Harper’s Ferry Hostel and Campground in Knoxville, MD (NOT Harper’s Ferry proper), which is open seasonally. 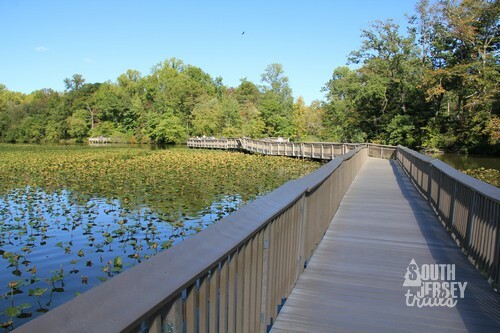 The next trail shelter is 9.3 miles from the bridge into Maryland (8.6 miles from the side trail to the ATC Headquarters). 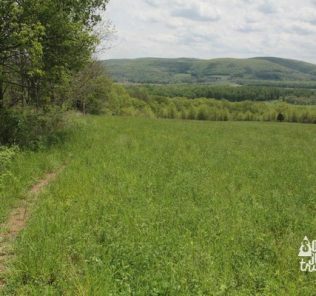 History, nature, views... you know, the Appalachian Trail. Zero complaints about this stretch at all. It's amazing and you have to do it right now. RIGHT NOW. 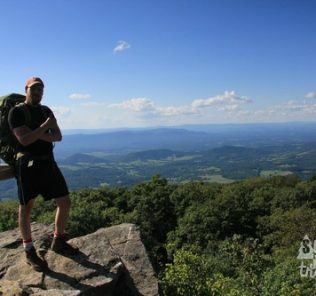 Appalachian Trail, Backpacking, National Park, national parks, Outdoors.